As soon as Jair Bolsonaro was confirmed as President-Elect of Brazil, on October 28th, the media rushed to his condo in Rio de Janeiro for the first official announcement. With his wife by his side and other friends, Bolsonaro said that before doing anything they would pray. Senator Magno Malta, (also a Gospel singer), thanked God and prayed for a new time for the nation. That was a first in Brazil’s history. In fact, the role of evangelical figures in this election was historical and prayer was common throughout Bolsonaro’s campaign. As many pastors and evangelical leaders gathered around the candidate, polls showed that although his victory was deemed unlikely, he would become Brazil’s next President. Two months later, Bolsonaro’s name is well known outside Brazil. Now he is receiving prayers not only from Brazilian pastors, but from other countries as well. 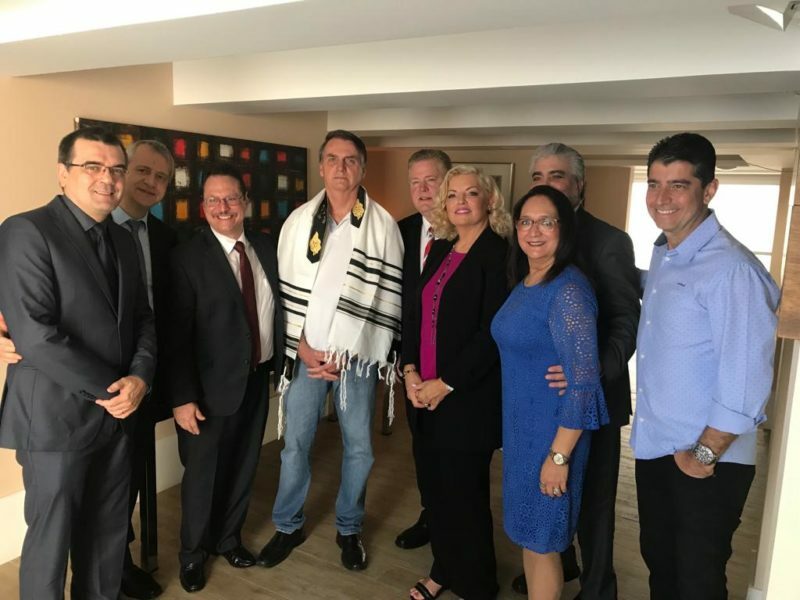 This week, Mario Bramnick, president of the Latino Coalition for Israel led a team of evangelical leaders to meet with the President Elect as well as Brazilian political and religious leaders in Brasilia, where they met future cabinet members including Damares Alves, pastor nominated to be Secretary of Human Rights. Bramnick believes Damares “will do an amazing work as Secretary, fighting for Human Rights and religious freedom in Brazil and abroad”. On December 20th, Pastor Bramnick, along with American pastors Jim and Rosemary Garlow of Well Versed Ministries; Ramiro and Orphalina Pena of Ramiro Pena Ministries; Albert Veksler of the Jerusalem Prayer Breakfast, and Brazilian Pastor Josue Valandro had an opportunity to meet Bolsonaro and pray with him. The picture of the gathering shows from left to right: Jarbas Aragao, Brazilian Christian journalist; Albert Vexler; President Elect Jaír Bolsonaro; Jim and Rosemary Garlow; Ramiro and Ophalinda Pena; and Pastot Valandro. Pastor Pena gave the President Elect an Israeli prayer shawl, thanking him for all his support for Israel. Albert Veksler said: “We are thankful for President Bolsonaro’s stand for Jerusalem and his friendship with Israel”. “We are very thankful for the opportunity to stand with President Elect Bolsonaro in solidarity with him. Evangelical Christians in the US are very aware of his role in the new political scenario in South America and are praying vigorously for his health and the prosperity of the nation”, said celebrated pastor Garlow. His wife, Rosemary, said the “evangelical Christians of America are honored to visit Brazil and to stand with the elected government at this crucial moment”. After the meeting, Pastor Pena commented: “We are very thankful to be here and to pray for Brazil. We love this nation and its people”. Pastor Bramnick stated the “we strongly believe that the hand of God is upon president Bolsonaro and that God has a tremendous purpose for the future of Brazil”. Valandro, who leads Igreja Batista Atitude, in Rio, which Bolsonaro’s family attend, understands that “the moment Brazil lives is crucial for our future. I am very happy to be with my brothers and sisters from other countries, showing that we are walking in unity and we deeply believe this opportunity to pray with leaders from the USA and Israel has a prophetic meaning”. Hoje pela manhã recebi visita de representantes de igrejas evangélicas americanas, onde pudemos conversar um pouco sobre suas e nossas visões. Mesmo sendo católico, creio que toda religião traz consigo algo que possa agregar a qualquer um de nós como pessoas comuns! O que importa é que sempre tenhamos fé! Seguimos nossos compromissos diários! Um bom dia a todos! The Brazilian President Elect posted a picture of the meeting on his Instagram account commenting that he was thankful for all the support and prayers and “it is important for all of us to have faith”.